Summer is synonymous with blackberries for me. I love blackberries. For starters, it is easy to eat (no peeling!). Plus, the sweet and juicy flavor makes for a tasty treat. No wonder, it’s a favorite among kids. But along with these magical benefits of blackberries, you didn’t know about. Whether it is the skin, hair or overall health, this yummy fruit extends its benefits to all. Blackberries are available in plenty during mid-autumn. They are aggregate fruits, composed of several smaller fruits known as drupes. The blackberry belongs to the Rosaceae family (1). The fruit is deep purple in color with smooth, fragile skin. 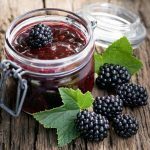 Thanks to the fruitfulness of blackberries, they have even found mention in the Bible and British folklore. Are blackberries good for you? Still doubt the caliber of blackberries? 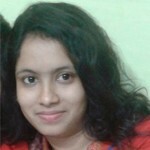 Here is a post on blackberries’ benefits for skin, hair and health. But before I start listing out the various blackberry benefits, here’s a detailed chart elucidating their nutritional value. Check out here nutritional value of blackberries right here. Our skin plays a vital role in our outer appearance. Most of us fail to realise that our skin eventually reflects what we eat. A good daily supply of vital nutrients is required for a glowing and perfect skin. Blackberries are rich in Vitamin A and Vitamin C. They also offer the highest levels of some antioxidants – higher than blueberries and strawberries too. The very dark color of the fruit is proof of its high antioxidant level. As a result, it is beneficial for the skin. Anthocyanocides and polyphenols are two antioxidants found in abundance in blackberries. These help in fighting free radicals (2). The collagen-forming Vitamin C and Vitamin A make it only more appropriate for skin. These vitamins also act as antioxidants. The regular consumption of blackberries protects the skin against the damaging UVA and UVB rays and aids in skin cell renewal. 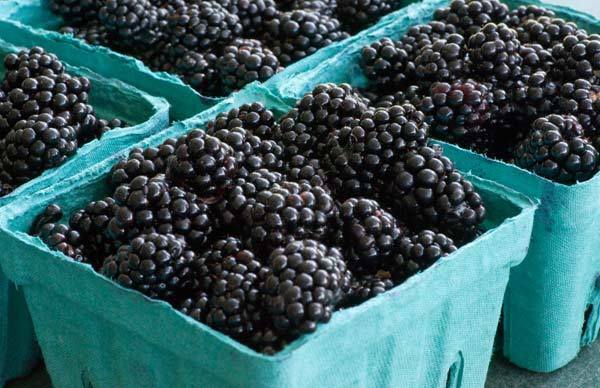 Blackberries are comprised of more than 85% water with an abundant dose of fiber. Both of these are essential for a healthy-looking skin. The consumption of blackberries detoxifies the body and maintains the elasticity of the skin (3). Take a bunch of blackberries. Crush and mix the juice with a teaspoon of honey. Apply this to your face and neck. Let it dry well before washing it off thoroughly. This face mask is ideal for hydrating the skin while supplying essential nutrients to it. Vitamins A, C and K in blackberries are excellent for skin rejuvenation (4). Their omega-3 and omega-6 fatty acids-rich seeds are vital for healthy skin. Here’s an effective face mask recipe for skin rejuvenation. Grind a bunch of blackberries. Blend these with some fresh yoghurt. Add a pinch of nutmeg powder and ¼ cup of lemon juice. Apply this mask evenly on your face and neck. Wash off after 25 to 30 minutes with lukewarm water. The regular application of this face mask will help rejuvenate your skin. It will also ensure smooth, moisturized and hydrated skin. Blackberries are great for cleansing and detoxification of oily skin too (5). Mix 2 tbsp of fuller’s earth with 1 ½ tbsp of blackberry juice. Mix well to form a thick paste. Add a few drops of tea tree oil (only if you suffer from acne). Dampen your face and apply this mixture evenly over your face. Wash off after 2 minutes. This natural skin cleanser will help remove excess oil and shrink the pores, purifying your skin from deep within. Blackberry leaves contain tannins with brilliant astringent qualities (6). These prevent the formation of blood clots. Traditionally, the fruit leaves are used to heal wounds, open sores and scratches. Blackberries also assist in soothing skin ailments like psoriasis. The antioxidants aid in clearing acne. The brew made from blackberry leaves is applied topically to cure eczema. The high content of antioxidants in blackberries makes them ideal for hair care too. Vitamin C, found in blackberries, is largely responsible for collagen production and contributes to strong hair. The antioxidants help combat the harmful and damaging effects of the environment on the hair. The topical application of the fruit extract is known to add instant volume, shine and bounce to the hair (7). Here are some of the best blackberries health benefits. The leaves and bark of the blackberry plant are consumed traditionally. They are used to treat mild gum inflammation and bleeding gums too (8). Consuming blackberry leaves helps get relief from excessive bleeding during menses. The fruit is also used to regulate menses and considered a uterine tonic (9). Blackberry leaves and fruit can help treat diarrhea. To use, simply boil the leaves or the fruit. Strain and drink the water to get relief (10). The high potassium content of blackberries helps reduce insulin. The daily consumption of blackberries with one teaspoon of honey helps control diabetes. For best results, it is best advised to have this for at least a week. Not only the fruit, blackberry leaves also can be consumed for their anti-diabetic properties (11). The decent content of calcium found in blackberries contributes in strengthening the bones (12). Blackberries contain minerals like potassium, manganese, copper, and magnesium. Together, these help a great deal in producing white and red blood cells (13). The pulp made from blackberry fruit is widely used to heal hemorrhoids and even conjunctivitis (14). Blackberries have an antioxidant called Ellagic acid. This can help in the prevention of the growth of certain cancer cells (15). This was about amazing blackberry fruit benefits, now learn how to select and store this amazing fruit. How To Select And Store? Choose the ones that are moderately firm, plump, dry and uniformly dark purple in color. The bunch should be fragrant and without the stem caps attached. When the hulls are attached, it means that the berries were picked too early, before they could mature. Avoid berries with odd spots, colors or shades. Signs of bruising or staining on the container indicate bruising and injury. Try and buy locally grown berries. These are likely to be sweeter and juicier than the ones that are bred for shipment. Watch out for molds. These are common in berries and they spread quickly. Hence, a moldy berry should never be placed next to a good one. Try and consume them as soon as possible. Never wash or hull blackberries until you want to have them. Unwashed berries should be refrigerated immediately. Soft, overripe berries should be removed for immediate consumption. Smashed or moldy berries should be discarded. The remaining berries should be blotted dry with a paper towel. Place them in a box or spread them on a shallow plastic pan or plate. Cover with a paper towel and wrap with plastic. Fresh blackberries generally last for 2 days. But they can be frozen and enjoyed all the year round. You may get pre-packaged frozen berries. But remember that these might contain added sweeteners. Spread the berries in a single layer, slightly apart on a baking sheet. Now place the sheet in the freezer until it is solid frozen. Now transfer it to an airtight container or a heavy plastic bag. Seal tightly, pressing out all the air. These will surely last for 6 months. Alternately, individual berries can be frozen on a cookie sheet and then packed into zip-lock bags, plastic bags or plastic containers. They can also be frozen by mixing with ¾ cup of sugar per quart of berries or packed in sugar syrup for freezing. Remove frozen berries from the refrigerator 1 to 2 hours prior to serving. Blackberries taste their best at room temperature. Drizzle honey over fresh blackberries or toss them with a little sugar. Combine different berries and relish the goodness of a yummy fruit salad. Mash blackberries and strain them through cheesecloth or a fine sieve to remove the seeds. This juice can be either mixed with water or a sweetener. It can also be canned or frozen for future use. Add the above prepared juice to smoothies, mocktails and cocktails. 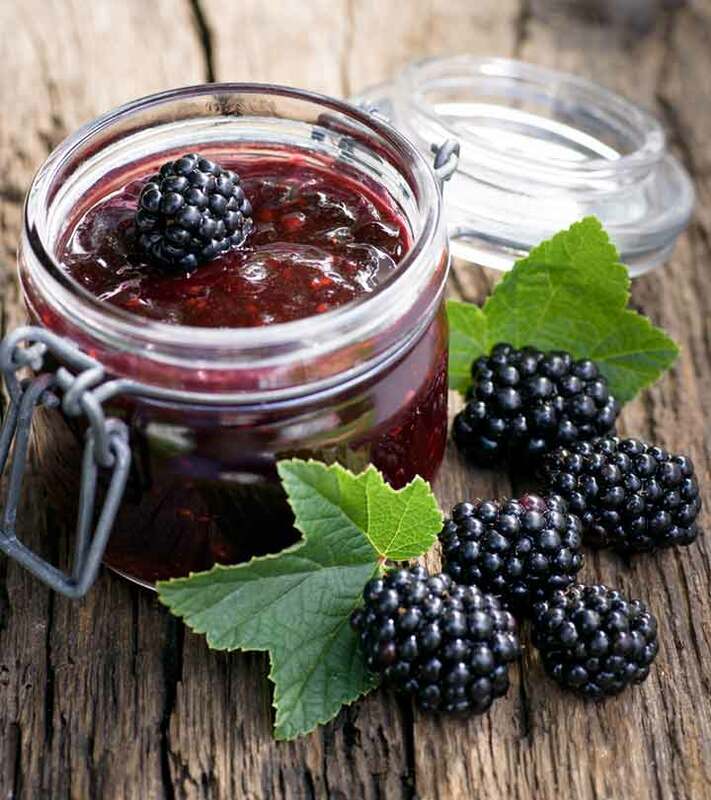 Use whole blackberries and sugar to prepare lip-smacking jams, jellies and conserves. Blackberry syrup can make for a tempting topping for ice creams and pancakes. When serving as a dessert topping, sprinkle some toasted almonds and hazelnuts. It can also be used as fruit syrup to add more flavor to drinks. Boil equal amounts of blackberry juice and sugar for 2 minutes. Your blackberry syrup is ready! This syrup can be refrigerated. To increase its shelf life, place the syrup in a sterile jar and process it in a boiling water bath for 10 minutes. 7. A handful of blackberries can be added to an apple crumble to prepare a delicious autumnal pudding. It can also be mixed with apples in blackberry pies, muffins and cakes. 8. Use it as a condiment with meat and seafood. 9. Blackberry liquor is also loved by many. To make this, berries and sugar are macerated with 80 or 100 proof vodka for two weeks. The mixture is then strained and more vodka is added to it. 10. Mix blackberries with apples, kiwis and strawberries to make a delicious fruit salsa. Enjoy it with chips. 11. Blackberry leaves are used for a refreshing cup of tea or as a therapeutic drink. It has a bitter taste so add honey or other sweeteners to enjoy it better. Hope you liked this post on benefits of blackberries. Do you love blackberries too? Tell us how you include blackberries in your diet. Also share what benefits blackberries have had on you by leaving your comments below.